Campagnolo USA does not carry an inventory of parts for sale to bike stores. Instead they allow wholesale/distributors to buy directly from Campagnolo Italy with Campy USA forwarding the order. The importer/distributor receives the goods 90 to 100 days later, relying on good forcasting so the Campy parts sell fast enough that the inventory carry costs are met. In general none of these distributors take very big risks in the product mix they buy. Even though Campy literature may claim that they manufacture various combinations of parts, if no distributor orders it... for all practical purposes they don't really make it. They make it available to distributors that may choose never to buy and sell it. Just try to find a Record OR rear derailleur, even Campy USA can't recall a distributor in the US that ordered them in 1995. Many of the cogset variations may not be avaialble at the time you order. The Campagnolo cassette freehubs use their own spline pattern. If the cassette that comes with the hubs wears out, a Campy replacement is your only choice. The cogs are die-cut from plate steel, then stamped to make the Exa-Drive teeth which are twisted with a tapered front face. Each of the cogs has one or more sets of "ramped" teeth which are stamped to a smaller thickness, then they are chrome plated. The cogs are 1.8mm thick and come with 3.0mm Black plastic spacers so they conform to industry index width standards though they have the unique spline pattern. A chromed steel lockring holds the cogs and spacers in place. The notch pattern of the Campy lockring is close enough to the Shimano lockring pattern that the Park FR-5 tool can be used to tighten or remove it. These are made to work with Record, Record OR, Chorus, and Athena rear cassette hubs. The steel cassette sets are available in 7 combinations and we sell six of them. 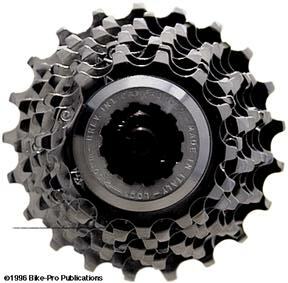 The same cassette cogs described above are also avaialable in aluminum alloy. The Super Record rear hub is made with an aluminum freehub cog carrier. Using a steel cog on it will damage its shape. These are Campy recommended solutions. The first position cog and the lockring are still made of steel. The SR cogs also come with the 3.0mm plastic spacers. These 8 speed cassettes are made five of the same sizes used for the steel models.